World music history began about years of 590 when people developed their life into arts and budaya. But most of music that we can enjoy now is originally named pop music era, it begin popular and well known about 1952. We know since then music history improved when pop music at it golden era we found out a lot kind of classes music from pop music popped out, like : ragtime, blues, jazz, rock, dangdut, country and more. Legendary musician who have good skill sing a song or playing music instrument. The Beatles generation, Michael Jackson, then turn to Boy band era like Blue, N’sync and etc. Avenged Sevenfold, Paramore maybe become so famous now. But a really most influence world music now is Boyband. Boyband recycle it golden age popularity now but this time it’s not come from USA or UK, it came from Korea. They are can be so influence so at Indonesia then popped out idea to make boy band the same way (at characteristics) with at Korea. Their international booming little bit because had been supported by Korean drama. We also know Korean Drama was so popular because their unique and lovable story mixed with original culture based on Korea tradition from their ancestors. Korean drama quite popular, another country people also love watching it because it didn’t make bored easily. Lovable Korean drama always takes original sound track from local musician then they had a good publicity both dramas and original sound track. Popular boy band who can dance and sing a song at the same time, they looks so different with Blue or Nsync or Backstreet Boys and much boyband which famous before them. They have their own character. You can see that when watch their video clips. Korean boyband have really same characters at all, they love to coloring their hair with yellow or white and some how look like so pretty as woman. Just few of them have a manly body, most of them so slim but quite tall. One of boy band in Korea and can make people think that Korean Boy band can be manly and didn’t look pretty like Korean girls is : Big Bang. Big Bang born on 2005 and have their debut at 2006 at YG family’s concert, Soul. Before the group debut, several members already had an exposure in the entertainment industry. 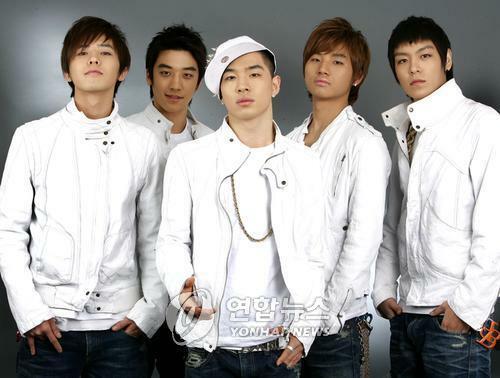 Big Bang when started their debut actually have a six personnel but now they just have five personnel : G-Dragon, Taeyang, T.O.P, Daesung and Seungri. At 2007 Big Bang take their success to wins people’s heart. Their concert album sold 30k copies by the end of year. In august, Big Bang release “Always” as their first mini album, followed by promotion and press conference. The leader of Big Bang who have quite natural handsome looks even he coloring his hair to white, G-Dragon starting write a few lyric for “Always”. Lies, one of title song in “Always” make a big surprise because it became the most people favorite beside win a many praised from the music critics. Big Bang wins many award at these year, Best Men Group and Best Song at M.NET/KM music festival. And at 2008, Big Bang wins Daesang award (best artis) from 17th Seoul Music Awards. Their next mini album, titled Hot Issue released a few month after Always and make their single “Last Farewell” become hit. Last Farewell takes Song of The Month Digital Music Award and stay at Juke-On number one song, 8 weeks long. Big Bang beginning their international debut with decide make it true at Japan. Big Bang’s Japanese first album titled For The World released at 2008. It album contains Korean and just one Japanese song titled How Gee (remix from Black Machine song). Big Bang third album when going back to Korea at the middle 2008 titled Stand Up which is sold about 100k copies and Day By Day single sit on 1st position at Korean song rank about six weeks. At the same time Big Bang release their Japanese song titled Number 1 from self titled album and introducing their song at Japan’s radio and television programs. At the end of 2008, Big Bang release Korean album titled Remember which have a hit single titled Sunset Glow. At 2009, Bid Bang group decided to take some rest for give a chance to it personnel for having solo career. They product Lollipop song with Girl Band named 2NE1. After success with their “Lollipop”, Big Bang release (again) Japanese single titled My Heaven at May 2009. This song is translated from their Korean song “Heaven” from Stand Up album. Not just “My Heaven”, Big Bang released too Let Me Hear Your Voice which is Japanese version from a same title. Let Me Hear Your Voice at Japanese become Kow Wo Kikasete which composed at Japanese and English lyric. as group leader, rapper, lyrics writer and song composer. His real name was Kwon Ji Yong. He had his debut at Dae Han Min Gook Hip Hop Flex at 2001.
as vocal and also a choreographer. His real name was Dong Young Bae. He had his debut at YG family 2nd album 2002.
as rapper, beat boxer and song composer. His real name was Choi Seung Hyun. as vocal. His real name was Kang Dae Sung. as vocal and choreographer. His real name was Lee Seung Hyun. His real name was Jang Hyun Seung. He didn’t be a part of Big Bang since ninth episode their video documenter. Now, he being part of another boy band called B2ST. So, are you wanna enjoying The Big Bang’s song? Then try to search and listening their ‘Somebody to Love’ and beat up with them. It’s better when listening that song and also watch their video clip, it’ll add more ‘effect’. And maybe you should be careful, because you may falling for them too.